From time to time some of you readers send in interesting emails that you have received on the subject of Van Norden Lake. 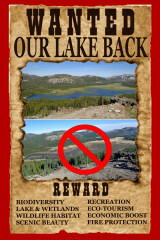 We recently received one from someone that had received an email from the director of the Truckee Donner Land Trust (TDLT). The subject of the email was our publications about Van Norden Lake and wetlands and the direct quote described our postings as “absurd and unfounded assertions as science”. First, let us state that while much of the information we post references scientific sources we do not claim that our posts are scientific studies. The author of most of our posts, George Lamson, was a working scientist for 30 years and is well versed in the scientific process (see short bio below). However, the issues in this controversy have been much more political than scientific and for the most part require simple critical thinking and common sense rather than an extensive scientific background. Our organization realizes that all information should be considered critically and is only as good as the data that supports it. While we stand by the information that we present, we are always open to modifying the information if new valid data supporting the modification is discovered. The accusation of “absurd and unfounded assertions” did pique our sense of irony. In the spirit of the pot calling the kettle black, we couldn’t help but marvel at the fact that many of the absurd and unfounded assertions that have been made in this controversy have in fact come from TDLT. In this and following posts we would like to address some of these assertions. Our first absurd assertion was made in yet another email I received from a donor to the Land Trust. This donor had received the email from the Land Trust director as the reason that they were forced to drain the lake. We have discussed water rights in previous posts at this site (link1, link2, link3) and we would urge you to review those posts for more information. To put the absurdity of this statement into context, the total cost of the entire Royal Gorge acquisition by the Land Trust was 11.25 million dollars. We have consulted with prominent water rights attorneys in Sacramento that have given estimates in the 50 thousand dollar range for a successful application. The figure quoted by the Land Trust would be over 250x that figure. Does anyone really believe that rights to a miniscule 49 acre-ft of water would cost 15 million dollars? We understand that obtaining water rights is an unanswered question at present. The fact is that no one really knows if water rights would be granted by the State Water Resources Control Board (WRCB) or how much the cost would be. We can make estimates based on similar situations but unless an application is filed, those estimates are speculative. Unfortunately, the Land Trust has failed to even file an application even though they were advised by the WRCB when they acquired the property (see this letter). Three years ago when the Land Trust was planning on keeping a 49 acre-ft lake, which was their first plan, they did not apply for water rights despite a request from WRCB. Had they done so it would probably not be issue right now. The application would either have been approved or not. While there is probably a good chance water rights would have been approved, it is possible that they would not have. In either case we would really know the answer. Unfortunately, the inaction of TDLT has led to yet another absurd situation. Due to their failure to address the water rights situation, this June the WCRB demanded that TDLT release all the water in Van Norden Lake (see this letter). At what must have been a significant cost to TDLT (that could have been better spent for a water rights application) they were forced to pump out the entire lake. The futility of this effort is that with the winter rains and spring melt the lake will fill again so that this nothing more than a bureaucratic exercise. This all could have been avoided if TDLT had taken the advice of the WRCB (see 2014 letter) and applied for water rights and filed the proper statements of diversion. Probably the most disturbing aspect of this absurd assertion of a 7-15 million dollar cost is that it really had no basis in fact and appears to be an obvious scare tactic. We would reiterate our warning that the issues in this controversy have much more to do with common sense and critical thinking than science. Dr Lamson had a 30 year career as a working scientist. After earning a degree in biochemistry at the University of California Santa Barbars, Dr Lamson completed a PhD in molecular biology at UC Berkeley. After a Post doc at Stanford University Dr Lamson became a principle investigator directing a lab at Stanford. As a result of his work in genomics and informatics Dr Lamson became a project director at a prominent bioinformatics company in Silicon Valley which ultimately led to his position as the director of bioinformatics at the biotech company Chiron. Dr. Lamson has published numerous publications in scientific journals and is a patent holder on many DNA sequences. After retiring in 2005, Dr Lamson became a full time resident of the Serene Lakes Community where he has owned a cabin since 1998. 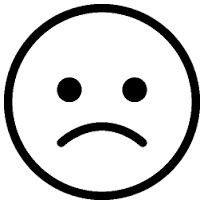 10/30/15 Update – In the interest of full disclosure we would like to modify this post with some new information. While we still question why the entire northeast side of the meadow adjoining the lake was closed, it turns out that you can still get out to see the drained lake bottom if you come in from the southwest side of the lake. On this side the KEEP OUT signs are at the shoreline, which makes sense considering the lake bottom is mucky mess. It’s best to park along Soda Springs road and hike in through the forest. Not sure if we’ll see sign creep on this side too? 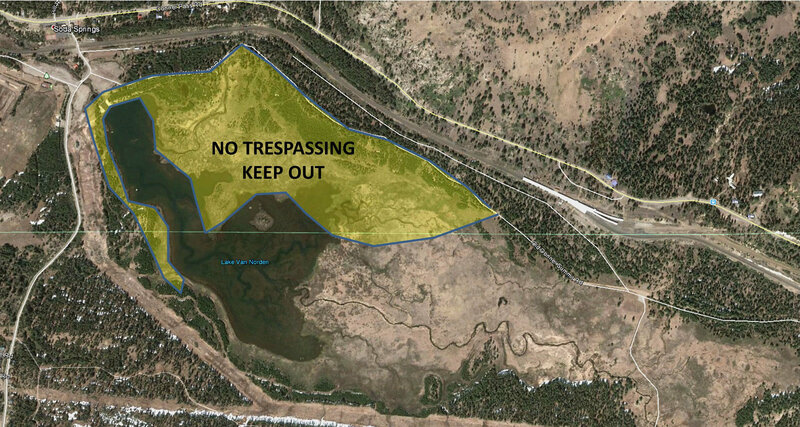 Remember back a few years ago when you would see the NO TRESPASSING signs everywhere in Van Norden Meadow. 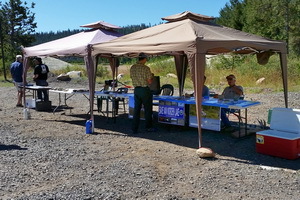 Then we all got together and gave our money to an organization that was going to buy the land and make it open space and “remove the signs forever”. Well the signs are back. When the heavy equipment starting showing up at the dam a couple of weeks ago many of us went down to observe. The first thing you probably discovered was there was this nice woman that immediately came up to you. After a minute of talking you realized that as nice as she was, she was the PR woman for handling any issues about draining the lake. She announced herself as a “third party” (whatever that is) and that she was responsible for making the process “transparent”. In that spirit the first thing she did was put caution tape everywhere to attempt to keep everyone away from the spillway where they could see what was going on. Our first encounter with her when we tried to get up on the dam to get some pictures, well away from any of the equipment, was we were nicely asked to leave the property. Next time we went down to the spillway we saw a sign the area was closed and to enter the meadow via “the road to the left”. So we drove down the county road to the first parking area and walked the 1/4 mile over to the lake to get pictures as it was being sucked dry. Next day when we returned to the same spot there was a hastily scrawled sign that said this area was closed. So the next day we went over to the west side of the lake and got more photos of the disappearing lake. So what do think happened the next day when we returned to that spot. You guessed it. There were keep out signs along the western approach to the lake. Now the Land Trust has effectively closed the entire east end of the meadow where they are draining the lake. Do they really need to close the entire east end of the meadow? 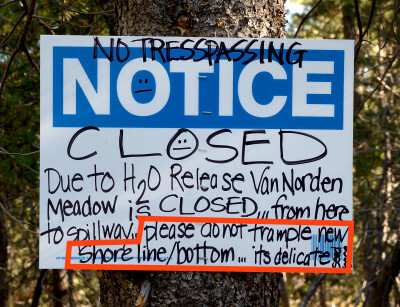 Probably the cruelest cut of all is the final line on the NO TRESPASSING sign, please do not trample new shoreline – its delicate. It’s hard to imagine a more harmful insult to the lakebed than removing the lake above it. To try to keep people out of the area under the guise that it is an effort to protect that lake bottom and shoreline really goes beyond the pale. Like a few footprints in the mud can compare to the damage done by removing the water. You have to wonder why the whole east end of the meadow, hundreds of yards away from the lake bottom and any “wet soil” needs to be closed. Of course I do have to admit that it is a somewhat effective way of making sure that people can’t see (or photograph) the dried out mud hole that was once the beautiful Van Norden Lake. 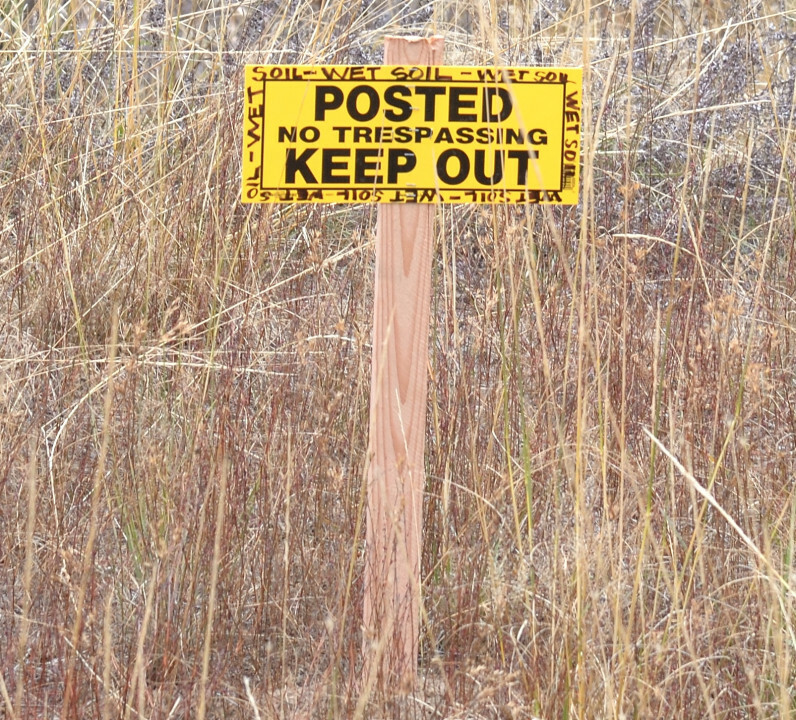 Goodbye OPEN SPACE – Goodbye TRANSPARENCY – Hello NO TRESPASSING – KEEP OUT. 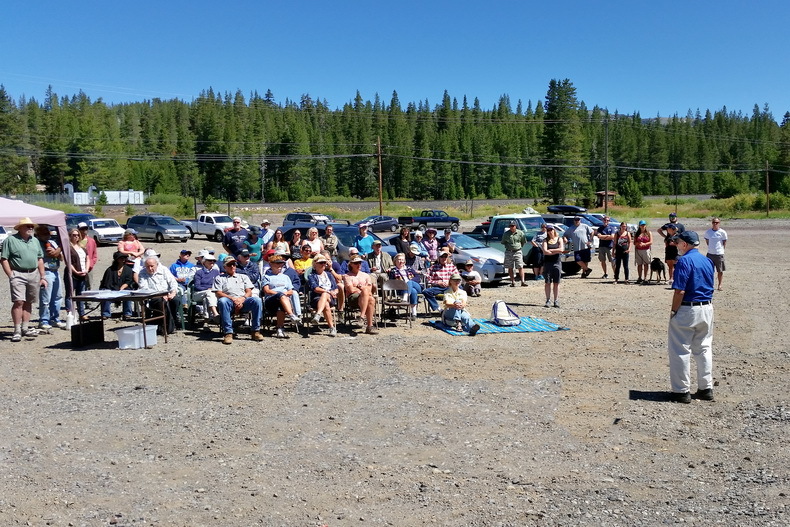 After the latest move by the Land Trust to drain Van Norden Lake there are a lot of questions from residents at Donner Summit and Summit lovers everywhere. There is a story running in the Sierra Sun right now that does attempt to clarify what is going on, but unfortunately the reporter apparently only spoke with the Land Trust and the article contains much of their misinformation. Here is a reality check on many of the arguments made by the Land Trust in that article. It is true that the present release of water from Van Norden Lake is due to orders by the Water Resource Control Board (WRCB). This is due in large part to the fact that despite their knowledge at the time of the property purchase, the Land Trust failed to respond to requests by the WRCB to apply for the water rights (see their letter to the Royal Gorge receiver from 2012 by clicking here). This was in 2012 when the Land Trust did plan to maintain a 49 acre-ft lake in the valley. Due to their inaction over the last 3 years the WRCB had no choice but to order the Land Trust to release the water. It is very interesting how the Land Trust portrays themselves as “working with the WRCB, when the reality is the WRCB’s order was a direct reaction to the lack of response by the Land Trust (see this letter from June of this year by clicking here). It doesn’t really sound like they are “working together”. Moreover it is clear that it is the lack of action by the Land Trust to apply for water rights that is the reason for the order. Many people have asked how the Land Trust can do this now without going through the CEQA process. This is not a permanent change to the dam as their plan to notch the spillway 5 ft is. This situation applies just to fact that the Land Trust is now the operator of the dam and the WRCB is only ordering that the water be released because they have failed to apply for the water rights. So now the Land Trust is releasing the water just as the winter rains and snow are coming. Water flows of 500-1000 cfs are common during the winter and spring months. The 24 inch drainage pipe at the dam will not be able to drain the lake at winter flow rates and with the heavy winter snows that the summit receives it will not be practical to set up the pumps that were used in the current release. 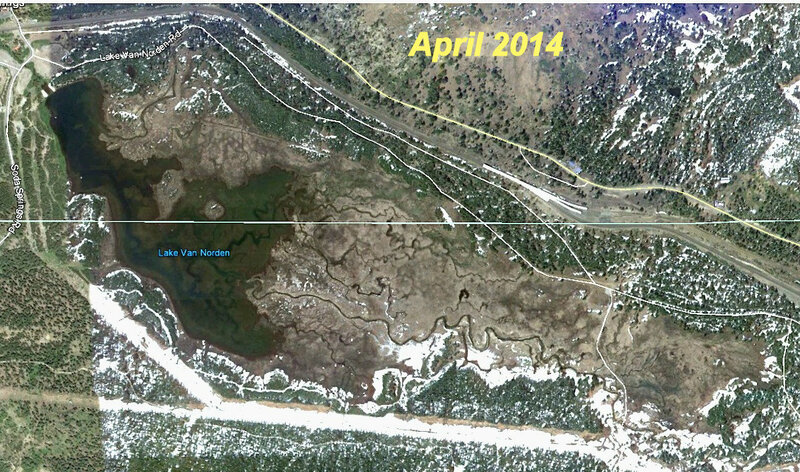 The result is that the lake will fill again during the winter and the spring melt that follows. 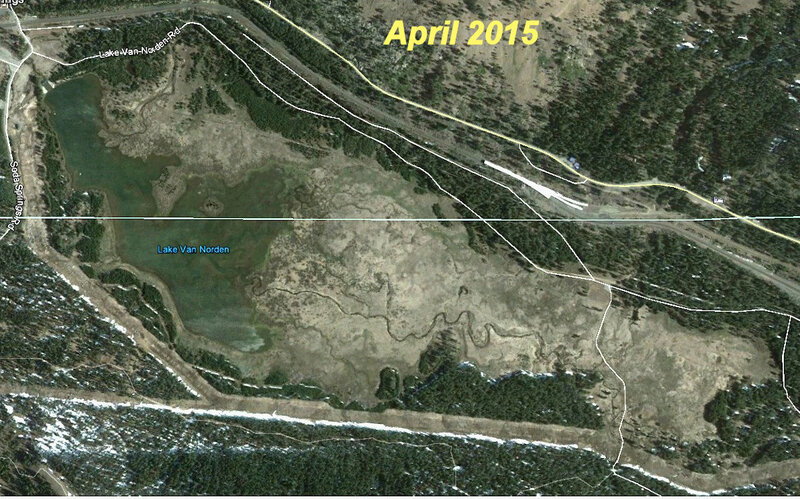 And yet the Land Trust claims they will be dispersing “native” plant seeds on the newly exposed lakebed. It makes no sense to start seeding the lake bottom at this time when the seeds will certainly be washed away by spring melt waters. The article discusses a number of options such as rebuilding the dam or removing it. Both of these options are very expensive and are probably not viable. However it should be made clear that the plan that the Land Trust is going to propose is the breaching of the dam’s current spillway by 5 feet to lower the level. It is so interesting to hear people talk about the “removal” of the dam when the Land Trust has no intention of removing any part of the dam other than the 5 ft of spillway. The reason, it would be expensive and the Land Trust does not want to spend any more money then they have to (see below). Since the reporter only got the Land Trust spin and did not talk with people opposing this move like us he of course completely missed the most viable option. That option is of course the compromise to notch the dam only 2.3 ft and leave a 49 acre-ft lake in the valley This is the original option that the Land Trust proposed and not only would it preserve some of the lake and wetland habitat but the notching would not cost any more money. It would meet the safety requirements of the California State Department of Safety of Dams (DSOD). It would still require securing water rights and our group (SaveVanNordenLake.Org) has offered to finance that option to allay the costs to the Land Trust. The use of the word “transfer” is a clever little ploy that the Land Trust likes to use when referring to their deal with the Forest Service. It doesn’t sound as crass as the fact that in truth they are “selling” the land to the Forest Service for $2 million dollars. This adds a significant financial motivation to any actions made by the Land Trust. It also makes it clear that despite it’s proclamations about the future of the Summit Valley, the Land Trust does not really have any future stake in what happens in the valley. That financial considerations don’t play a role here is belied by the fact it wasn’t until the beginning of 2014 when the Forest Service announced it would not pay for the land if the lake was present that the Land Trust adopted the plan for draining the lake. Contrary to the statement in the article, the transfer of the land and the plan to “restore” the meadow by draining the lake are completely interdependent. The simple fact is that if they don’t drain the lake, they don’t get the money. The current meadow lake and wetlands provide a rich blend of habitats that serve to increase the biodiversity of the Summit Valley. The aquatic habitats of the lake make the valley a breeding ground for waterfowl, fish and amphibians. The unique shallow water habitat of the lake make it a hot bed for Western Toad breeding. Hundreds of thousands of toads populate the valley in the summer due to the lake and wetlands. Migratory birds such as Sand Hill Cranes and Tundra Swans use the lake as a stop on the Pacific Flyway. 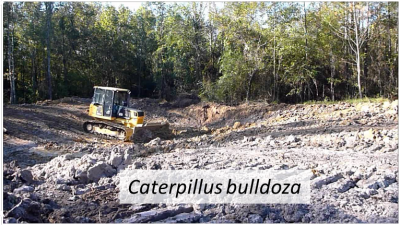 It is hard to understand how the removal of over 100 acres of lake and surrounding marshland habitat and all the flora and fauna that depend on it will result in an increase in the biodiversity. And yet you hear this again and again from the Land Trust. To paraphrase the immortal words of Inigo Montoya, we don’t think the word (biodiversity) means what the Land Trust thinks it means. Wetland wildlife habitat already flourishes in the valley. 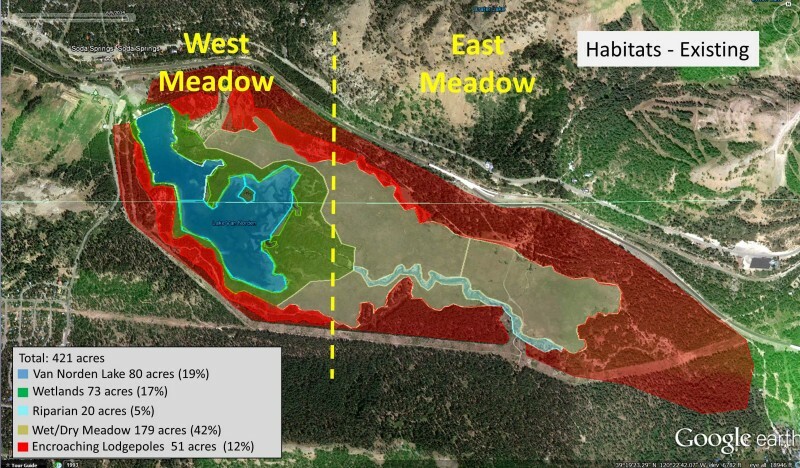 It is also difficult to understand how removing 70 acres of open lake and replacing it with meadow that already predominates the valley will increase the fishery. In fact, it is the lake that now supports the existing fishery. Contrary to what was said in the article, historically it is very doubtful that there were any fish at the summit prior to the 1800s due to the high elevation, cold temperatures and heavy snow. It was only after the dam was built the lake was stocked in the 1800s that any fishery existed on the Summit Valley. And probably most perplexing is the statement that habitat for the endangered Willow Flycatcher will be increased. Currently there are 70 acres of willow marshlands surrounding the lake and serving as perfect breeding habitat which requires not only willows but also open water. It’s pretty clear to anyone that takes a walk through the valley to see that the willows propagate around the lake where they get enough water. Removing the lake and dropping the water table 5 ft in the valley will decrease the willow population significantly because the willow roots only go 24 inches deep. You just need to look at how sparse the willows are at the east end of the valley where there is no lake to know what will happen to the willows once the lake is removed. 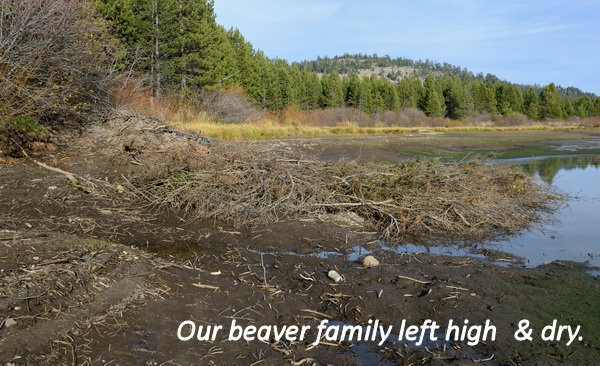 The reality is that increasing existing drier meadow habitat at the expense of sensitive lake and wetland habitat just makes no environmental sense. However, draining the lake and selling the land for $2 million makes perfect financial sense. 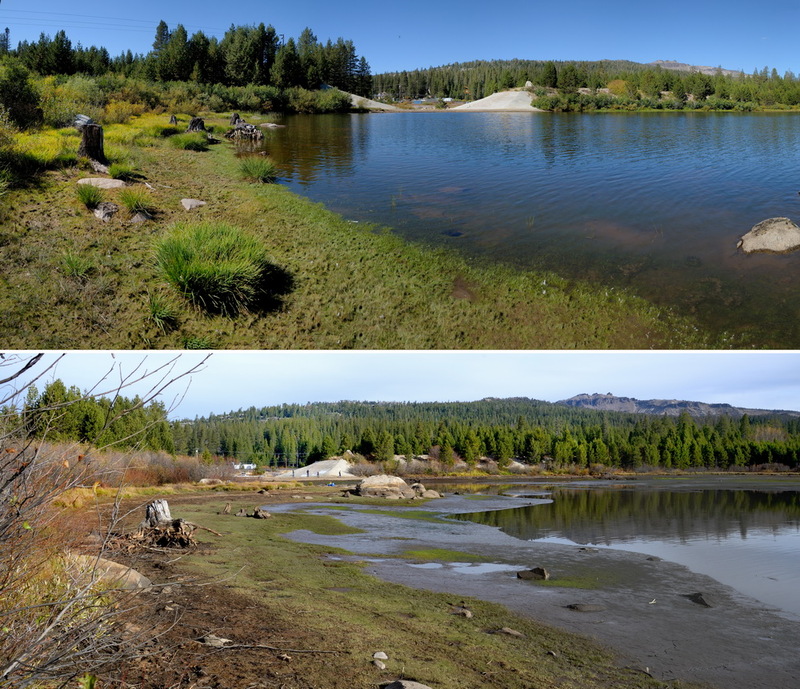 Van Norden Lake has rightly earned the moniker of “The Jewel of Donner Summit”. The setting for this spectacular high Sierra gem is the historic Donner Summit Valley. The blue jewel is the source of water that supports the rich open lake and wetland habitats that add biodiversity to the Valley. This week the jewel was removed from its setting and the entire valley is the poorer without it. 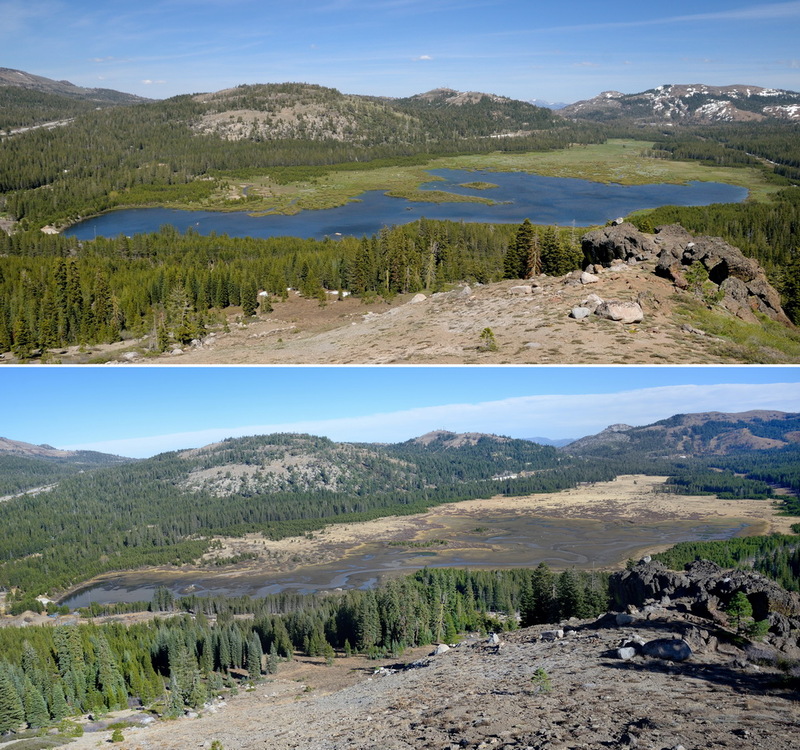 There has been a lake in the Donner Summit Valley for over a century, starting shortly after the first pioneers started pouring across the summit. There was a reason the early pioneers built a dam in the valley. Despite the fact that the Summit Valley has one of the highest snow falls in the Sierras, due to the high elevation and the non porous granitic soils only a miniscule portion of the resulting melt water from the 3000 acres of watershed stays in the valley. 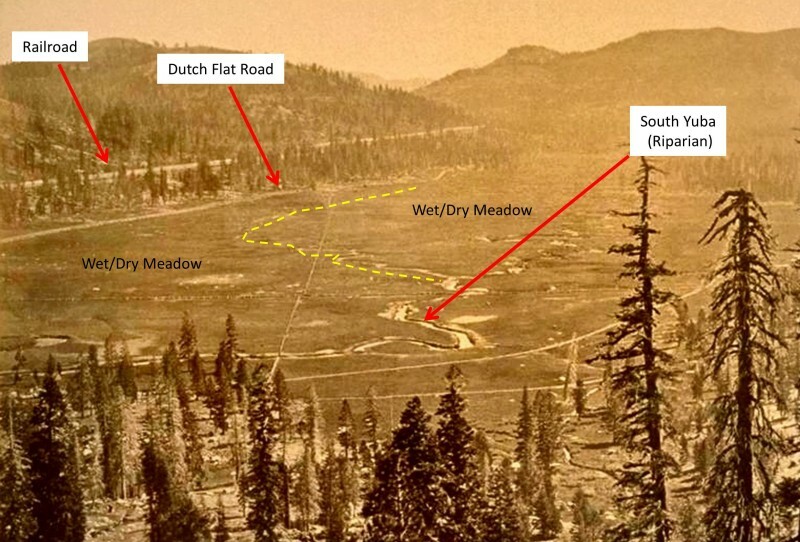 The same is true today and is at the heart of the recent controversial history of the Summit Valley since the property was purchased by the Truckee Donner Land Trust and they announced they were draining the lake. This controversy has been well documented on this website and elsewhere and we will continue to discuss the issues in future posts. This week the Land Trust was forced to empty the lake by the State Water Resources Control Board (WRCB) because of their inaction in obtaining proper water rights. The water rights issue has been discussed extensively in previous posts (see link1 & link2). The result of the Land Trust’s inaction is the blue Jewel of the summit has been pumped dry leaving a mud hole in its place. This dramatic loss of water from the summit is a preview of what could possibly happen if the Land Trust continues with its plans to breach the dam. This does not have to be the end of our Jewel. What we do have right now is a demonstration of the dire consequences to the Summit Valley if all of its precious water is allowed to drain away. There is however still time to preserve the jewel, albeit with a few less carats, if a compromise could be reached to keep a smaller lake in the valley. This is by no means the final end of Lake Van Norden. While the Land Trust has had to remove the water now because of their failure to satisfy the WRCB, it will return in the winter and spring when the rains come and the snows melt. The real question now is will this heist become permanent if the Land Trust breaches the dam. Fortunately, the breaching will still need to face the CEQA process and we will continue to push for maintaining a small lake in the Valley as a viable alternative to preventing total lake and marshland habitat destruction. July 25th was one of those spectacular summer days at Van Norden Lake that is what our celebration was all about. Not too hot, not too cool, bright blue skies, wildlife aplenty and a dedicated group of lake lovers made it a wonderful day. 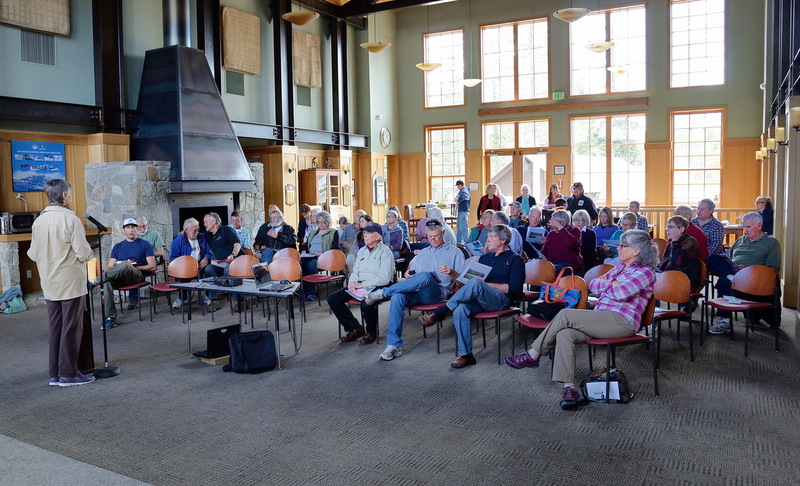 We would like to sincerely thank Dr. Charles Goldman for an excellent address in which his expertise and vast experience in conservation efforts inspired everyone and made us realize just how important high elevation lakes like Van Norden Lake are. As always it was also great to hear some of the history and lore of the lake from Norm Sayler. It was especially good to see many folks go out and explore the valley either on their own or under the expert guidance of Dr. John Cobourn. 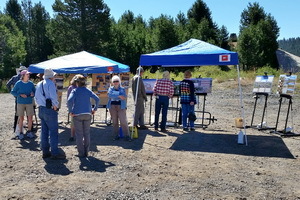 Our purpose in putting on the Van Norden Lake Day event was to raise everyone’s appreciation of the lake and wetlands and it was clear that was accomplished. It is always so gratifying to us when someone comes by to excitedly tell us how they never knew how truly spectacular the lake, wetlands and meadow are and how much they enjoyed it. It really rejuvenates our resolve to do everything we can to preserve this precious natural resource not only for today, but for future generations. Thanks to everyone who made this a great event! With the future of Lake Van Norden in doubt, we thought it would be a good time to come out and celebrate it while it is still here. Please come and join us in that celebration and learn about the lake and the wetlands and their place in the Donner Summit Valley ecosystem. We will have exhibits and presentations including Dr Charles Goldman of Lake Tahoe fame. Most importantly, we want everyone to come out and enjoy the lake and wetlands for themselves. Bring your kayaks, binoculars and lunch and go out and explore this wonderful natural resource. Join Dr. John Cobourn on an informative walk along the lake aroung 12:30 to experience it first hand. The Donner Summit Valley is at it’s summer best and there is no better time to paddle and hike it. The release by Google of new map imagery is not something most people get excited about. However, this year the new satellite imagery of the Summit Valley is particularly disturbing. The two satmaps included here are from just one year apart, April 2014 and April 2015. Now as we all know, 2014 was the third year of drought on the summit and it was a pretty dry year, but even in April of that year there was water draining in every channel. The really scary part of this however is that the April 2015 satmap shows very little water in the Summit Valley even compared to the 2014 map. In fact, the April 2015 map looks much more like the map you would see in June or July of a “normal” year. We have been lucky so far this year that May and June have had more rain than normal and it is stretching out the spring melt. However, once the warm weather settles in (and that should be soon) we can expect that the Summit Valley is going to have one of the driest years on record. This really brings home how important it is to keep as much water as possible in the Valley in the summer and why it makes no sense to be decreasing water by draining Lake Van Norden. Once in a while someone asks about our icon the White Pelican. Usually the question goes, “why do you use the White Pelican as your logo, it’s not really an endangered species”. My answer steals from the old adage that says “all politics are local”. I think of the environment and its conservation the same way. The White Pelican is an endangered species in the Donner Summit Valley right now. As a top predator, the White pelican depends on a complex habitat of open water lake and all of the fauna and flora present in that environment that supports the fishery that the Pelicans prey on. It is the destruction of that habitat that will result in the disappearance of the Pelican in the Valley. As long as there is an open water lake that can support the food chain that provides these magnificent birds with sustenance, they will continue to return to the valley every summer. 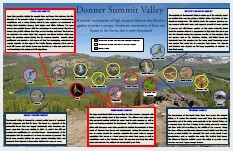 Once that habitat is removed, the White Pelican will be extinct in the Donner Summit Valley. SAVEVANNORDENLAKE.ORG and Bill Oudegeest and myself are anti-Land Trust — This is just not true. Both Bill and I were some of the strongest advocates for the purchase of the Royal Gorge properties. We both donated tens of thousands of dollars to the purchase. Practically all of the photographs used in the campaign to purchase the property were donated by me. I am a strong advocate of the open trail system being implemented by TDLT in the Royal Gorge area. We fully praise the efforts TDLT is making to restore the health of the forest and improve fire safety. We fully support the restoration of the existing meadow habitat in the Summit Valley. The ONLY thing that we are is PRO lake and meadow and do disagree with TDLT’s plan that the lake has to be removed. The SAVEVANNORDENLAKE.ORG website is “deceptive” in it’s information — This organization is all about truth and transparency. Of course we are expressing our opinions in many cases, but they are all based on factual data that is publicly accessible to everyone. Where appropriate we cite and link to the appropriate data. I invite anyone to point out anything that we have published on our website with proof that it is inaccurate and we will correct or remove that information. 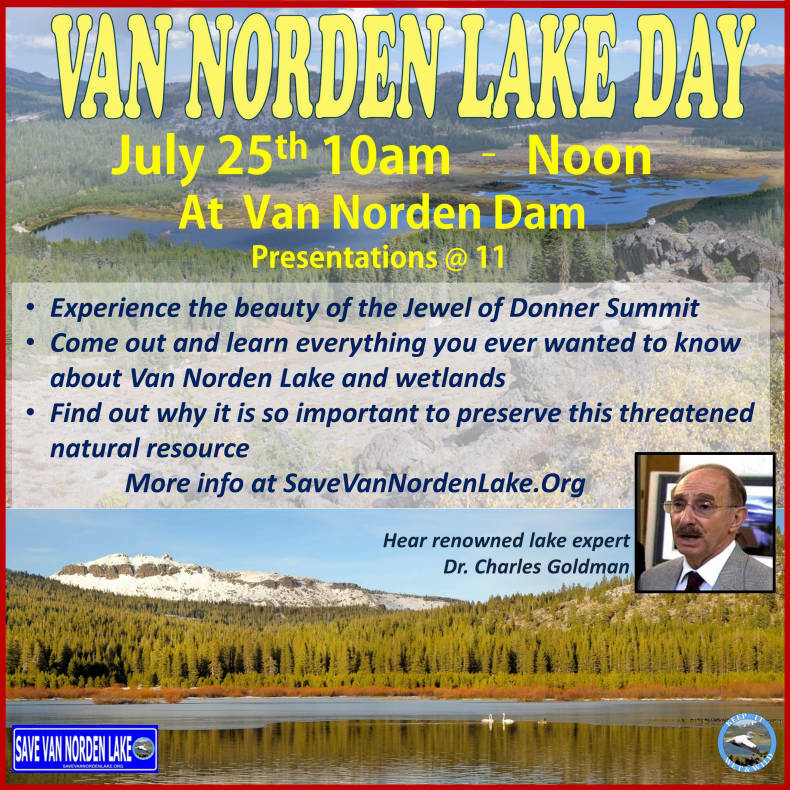 SAVEVANNORDENLAKE.ORG is forcing TDLT to spend thousands of dollars in studies and legal fees — Any project with the environmental impact like a plan to drain Van Norden Lake is required by the state of California to satisfy the requirements of the California Environmental Quality Act. It is these requirements that necessitate that the proper studies and legal steps be taken for any project of this magnitude. These studies are required by law and would have to be run whether anyone was opposing the plan or not. This is a situation of LAKE vs MEADOW — Currently we have a valley that has a natural harmony of rare alpine lake and marshlands surrounded by beautiful meadow. We at SAVEVANNORDENLAKE.ORG strongly support the restoration of the meadow in the valley and support the lake AND meadow, despite the characterization that has been made that we are against restoration of the meadow. We simply advocate the preservation of the lake and marshland habitats that already thrive in the valley in conjunction with the meadow. It will be too expensive for TDLT to successively breach the dam 2.2 ft and then later 5 ft if water rights are impossible to obtain — This one is a little inside baseball as they say but this was publicly stated by the director of TDLT at the forum. First of all, the estimate of the construction cost to breach the dam by the contractors Holdredge and Kull is $120,000, not the $500,000 that was stated (see their application to DSOD for the breaching by clicking here). It was also stated that a second breach would require another expensive round of CEQA. The CEQA process is very flexible and allows for alternatives based on project requirements. I have been assured by CEQA experts that successive breaching could easily be handled in a single process without a second round. We clearly don’t agree with TDLT’s decision to drain Van Norden Lake and will continue to make our case to them for a compromise solution. We will also push for this alternative as well in the CEQA process. We would only ask that the facts be stated clearly and honestly by all parties concerned as we continue these discussions.